Joe Lewis is one of the best-known names in the currency trading industry today, and undoubtedly one of the sector’s most successful business icons. It is estimated that Joe Lewis’ personal wealth is approximately $3.2 billion – his private art collection alone accounts for $200 million. 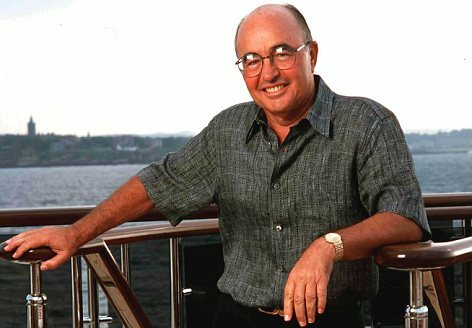 At the age of 74, Joe Lewis is ranked among the wealthiest people in the world; he lives in the exclusive gated community of Lyford Clay in the Bahamas, and a typical “day at the office” means boarding his 223-foot superyacht, the Aviva, which is the world’s longest motor yacht, and his own mobile workplace! Joe Lewis has certainly earned an industry-wide reputation to accompany his personal fortune – but where did his career start? Joe Lewis was born in the town of Bow, London – a far cry from the exotic luxury home he now occupies in the Bahamas. At the age of 15, Lewis had to leave school to work as a waiter at Tavistock Banqueting, his father’s catering business. Waiting tables might sound like a thankless menial job to most of us, but for Joe Lewis is turned out to be a springboard to a long and illustrious career. Lewis eventually took over the family business and managed to expand it significantly before selling it in 1979. From there, he took up currency trading and began building his fortune. If you’ve just started using a forex demo account, you may be interested to know that Joe Lewis gained a great deal of wealth through currency trading. Most notably, Joe Lewis and forex legend George Soros each made a small fortune in 1992 when they bet on the UK Pound being withdrawn from the ERM – an event now famously known in the currency exchange industry as Black Wednesday. The event earned Soros a staggering profit of around $1 billion, and some industry insiders believe that Joe Lewis made an even larger profit. Today, billionaire Joe Lewis is known as the founder of Tavistock Group, a world-renowned private investment company. Tavistock Group now owns more than 175 companies around the globe, ranging from the property sector to the sports sector. Joe Lewis also owns a number of luxury golf clubs and acts as the host of the annual two-day golf tournament known as the Tavistock Cup. The tournament has donated millions of dollars to charitable causes over the years. The world of currency trading might seem a little daunting at first, but forex trading brokers will assure aspiring that great rewards are possible with the correct guidance. With icons like Joe Lewis to inspire today’s traders, it’s no wonder currency trading is rapidly growing in popularity. Nicky Warner is an enthusiastic blogger looking to share news and information online with fellow writers. Currency markets never sleep and several trillions dollars are traded everyday, making currencies the world’s biggest and most exciting investment market. In recent years, mechanical currency trading systems, using technical analysis to predict trend movements have become increasingly popular. Marketing” lmddgtfy was indeed truly pleasurable and enlightening! Within todays universe that is tricky to carry out. Very interesting to know. Did Joe Lewis trade Forex spot or did he tarde in options that provide higher leverage? the particular premium you only pay. You still haven’t mentioned how he made it in currency trading. Can you be more specific? spot or Options? Micro or macro? does he scalp, does he follow a trading program? Back in the day many of these guys were ripping the markets as there no computer to aid in regulating. Is he still profitable? What strategy did he use? however this piece of writing is genuinely a nice article, keep it up. Could you please send my regards to Joe Louis who is an amazing good person from Jean-Marie Zimmermann. It leaves out the fact that He and George Soros fucked the Malaysian economy over. Personal greed, nothing more nothing less.